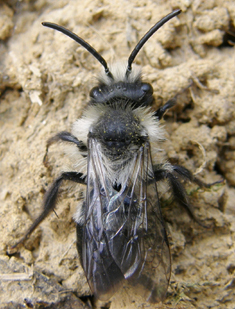 A distinctive Andrena species with a bluish-black cuticle and ash-grey hairs on the thorax and propodeum. Identification keys and general biology are given in Perkins (1919), Dylewska (1987), Schmid-Egger & Scheuchl (1997) and Else (in prep.). Recently recorded from Cornwall to east Kent and north to Durham with older records into Scotland reaching mid-Perthshire, Argyll and South Aberdeenshire. Also occurs in Ireland and the Channel Islands. This bee seems to be increasing its range, at least in southern England. A widely distributed Palaearctic species, the range extending from Fennoscandia, south to Iberia, and east to northern China. The female (above left) is one of our most distinctive spring flying mining bees. 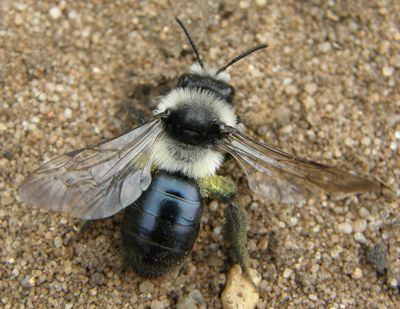 A black species with two broad white hair bands across the front and hind of the thorax. The abdomen is very dark and glossy with a slight blue-black hue. Open sunny areas usually on sandy sites (open woodland, moorland, coastal sites, river banks, old quarries). Also on friable chalk, silt and clay sites, and urban areas (garden lawns, golf courses). In southern England mainly on calcareous grasslands. Usually univoltine. In southern England males fly from March until May but mainly during April, and females from April until June but mainly during April and May. In northern England the flight period is later, with males from April until June but mainly during May, and females from April until July but mainly during May and June. Rare records of males from July and August and females from August may represent a second brood. Polylectic including buttercups (Ranunculus spp. ), mustards (Brassica spp. ), roses (Rosa spp.) and rough chervil (Chaerophyllum temulum). In Cumbria females have been seen foraging from silverweed (Potentilla anserina) (N A Robinson pers. comm.). A subterranean nester, sometimes in large compact aggregations in bare or poorly vegetated soil; in small aggregations scattered over a larger area, or found singly. The burrow is excavated to a depth of 10-20 cm with two to three cells per nest (Westrich, 1989). The burrow entrance is left open during foraging trips, but at the end of these flights, during rain and when disturbed the burrows are closed. The species overwinters as adults within the natal cells. In addition to those listed above; brambles (Rubus spp. ), cabbages (Brassica spp. ), cherries (including blackthorn (Prunus spinosa) and wild cherry (Prunus avium)), dandelion (Taraxacum officinale), daisies (Bellis perennis) , gorse (Ulex Europaea), hogweed (Heracleum sphondylium), pears (Pyrus spp. ), plum (Prunus sp. ), thrift (Armeria maritima), willows (Salix spp.) and wood spurge (Euphorbia amygdaloiodes). Nomada lathburiana (Kirby) is a cleptoparasite of this bee. G M Spooner (pers. comm.) observed specimens of N. goodeniana (Kirby) flying about and entering the nesting burrows of this species at a Dartmoor, Devon site. This latter Nomada is also stated to attack A. cineraria in Germany (Westrich, 1989).